The Copperheads were on a high after winning the south title the previous weekend, and were off to the league championship round in the days following their title win. A new set-up passed by the HJHL would have the final round be a best-out-of-three series. The Copperheads match was against the north division champion, Red Deer Vipers, who would have home advantage in the final. The schedule was tough to create as both teams were heading to provincials the following Wednesday, just six days later. Opening the weekend off in Red Deer on Friday night was game one at 9 p.m. Copperheads first period was astounding taking a 2-0 lead with goals from Ty Abbott and Levi Anderson. A moment of collapsing at 19:44 of the first snuck in a power play goal for Red Deer. Vipers came out strong in the second scoring four goals. Copperheads lone second period goal was from Jayden Smith, and a single in the third rounded out a 6-4 loss on the road. On Saturday night, the Snake Pit was a crowded affair as the Copperheads increased the tempo taking game two from the Vipers. Winning on home ground 4-2 was incredible feeling for all present. With overage captain Calvin Swanson playing his last home game, it was sentimental game that will not be forgotten. Goal scorers were Jedd Horvath, Brandyn Howg, Ty Abbott and Logan Middleton. Winning this game forced a decisive third game back to a Red Deer the following day. On Sunday during the 8:30 p.m. game in Red Deer, the Copperheads opened the scoring from D-Man Ryan Tessemaker. A struggle came to be the final minutes of the first when Swanson got handed a hit from behind penalty. Red Deer capitalized on the power play scoring under a minute left in the period. Copperheads Riese Nevil retrieving his own rebound to pull the orange Snakes ahead 2-1 at 3:55. Red Deer tied it 2-2 on a power play again at 11:50. The turning point later in the second saw the Vipers score a short handed goal which hurt taking a 3-2 lead. The Copperheads, not from a lack of trying, just couldn’t get the break they needed to catch up. Red Deer took the league championship with a final score of 4-2. Goaltender Nolan Berner played all of the championship three games; with a outstanding performance to say the least. 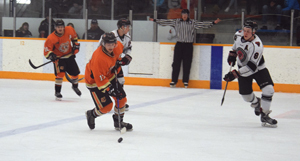 The Copperheads season is not over yet, with goals to fill next at provincials. I’m sure many will agree the milestones they crossed this year, with an outcome like this was phenomenal ending to league play.